Preheat oven to 140C. Mix the crushed biscuits and melted butter together and press into the base of a loose-bottomed tart tin. Bake in oven for 10 minutes, then remove and cool. Put egg yolks in a large bowl and whisk on high for 3 minutes. Add the condensed milk and whisk for 3 minutes more. Add the limejuice and all but a little of the zest and whisk for a further 3 minutes. Pour on top of the cooled biscuit base and return to the oven for 15 minutes. Cool and chill in the fridge for a couple of hours. Remove from the tin onto a plate. Whisk the double cream and icing sugar until it forms peaks. 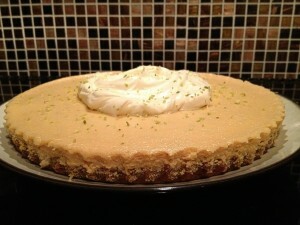 Spread over the pie and decorate with the remaining lime zest, sprinkled over. This can be made the day before and kept in the fridge. I had no Hob Nobs for the base, so I used 150g digestives and 150g ginger nuts. I also know people who have used just 300g ginger nuts, which make a nice contrast to the zesty, refreshing lime.